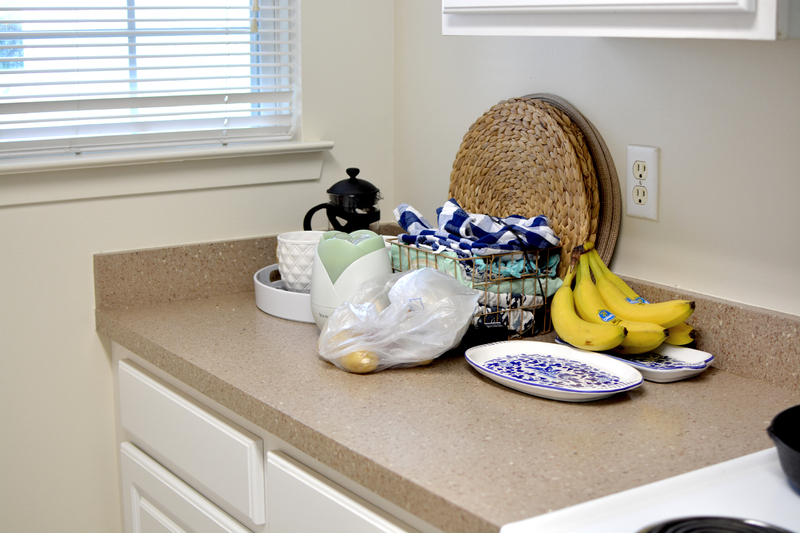 This is a sponsored post written by me on behalf of Devine Color by Valspar . All opinions are 100% mine. It was only last year that I was decorating for a dorm room or first apartment, which is crazy to me because it feels so long ago! Time flies…when you’re an adult and the bills pile up! All kidding aside, I used to love decorating my dorm room or apartment every year and I actually loved the greatest challenge of all: designing and decorating, and being able to turn it back to the way it was at the end of the year. It was really important to me to have my personality in the room as much as I could, without getting a bill at the end. So I was really excited when I found Devine Color + Target and I knew it would be the perfect solution to decorate a dorm room on a budget and have it be removable when it’s time to move out! 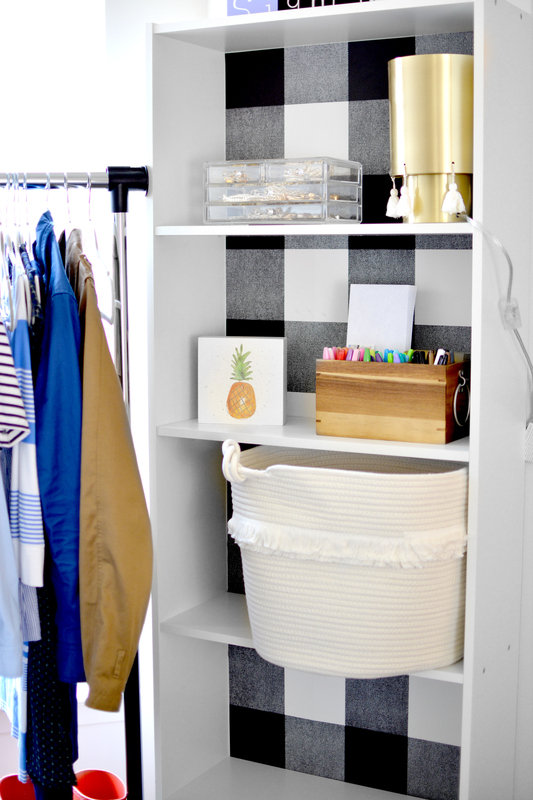 Are you ready…to get organized? 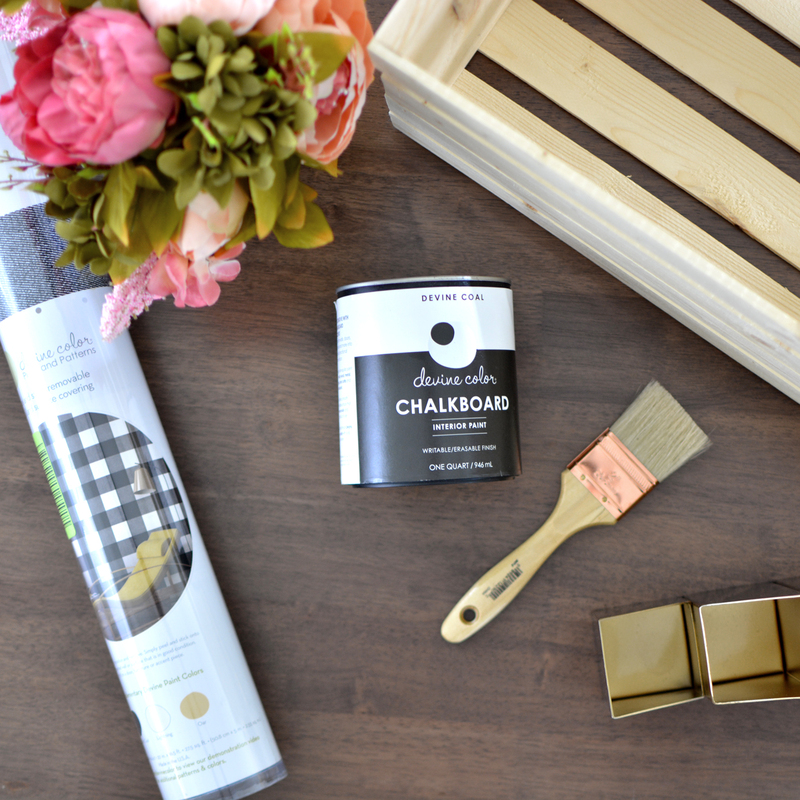 As soon as this opportunity came up I knew I had the perfect thing to paint: a couple of months ago I got a few wooden crates from Target but I never found a purpose for them. And then I painted them with a little bit of the Devine Color Chalkboard Interior Paint and they are my new favorite part of the kitchen! 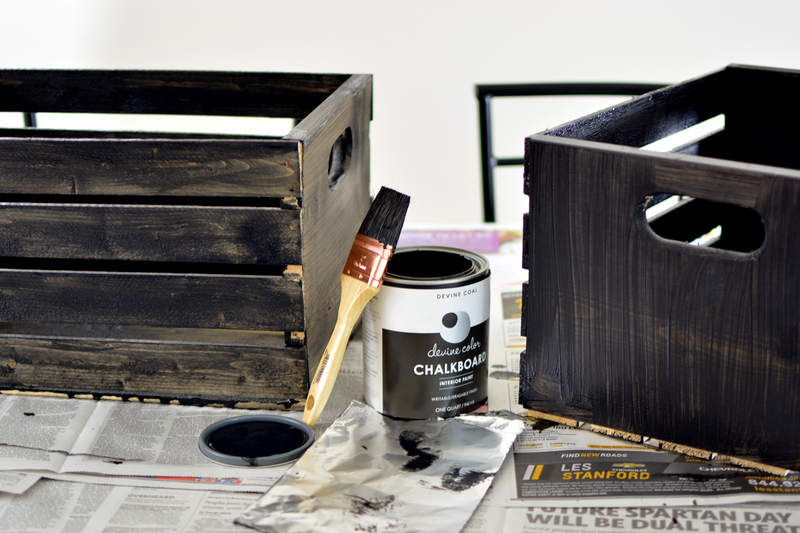 If you have an afternoon free, grab yourself a can of paint, a brush and a few wooden crates and get to painting! And to spruce it up even more, I took some of my leftover Buffalo Check Removable Wallpaper and stuck it on the back to bring a little more oomph to my kitchen storage. 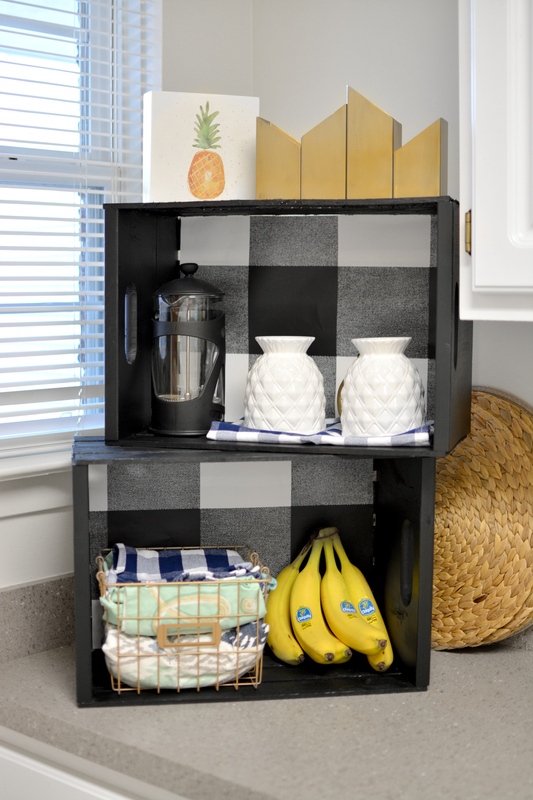 These crates are so perfect for dorm rooms because you can stack as many as you want and it makes it easy to organize: you can have one crate for coffee, one for school supplies, one with makeup, one with movies, the list goes on and on! 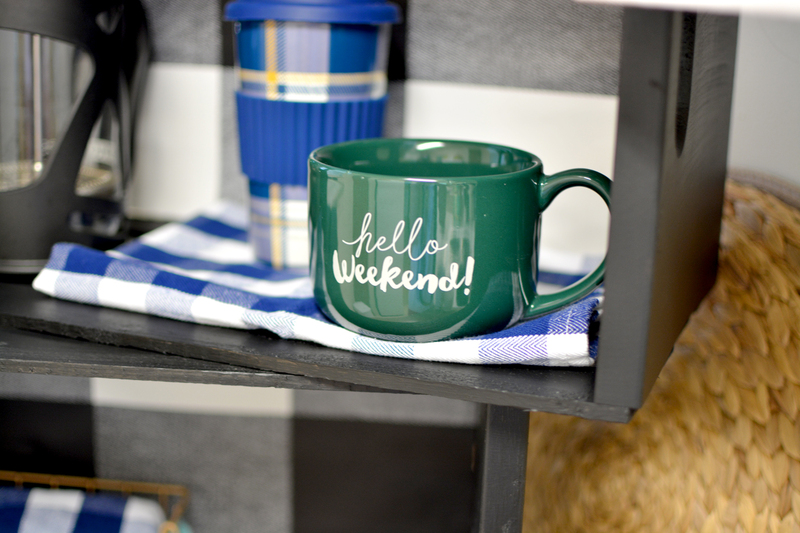 I accessorized mine with a few baskets and coffee cups from the ultimate stylish home goods stop: the Target Dollar Spot! 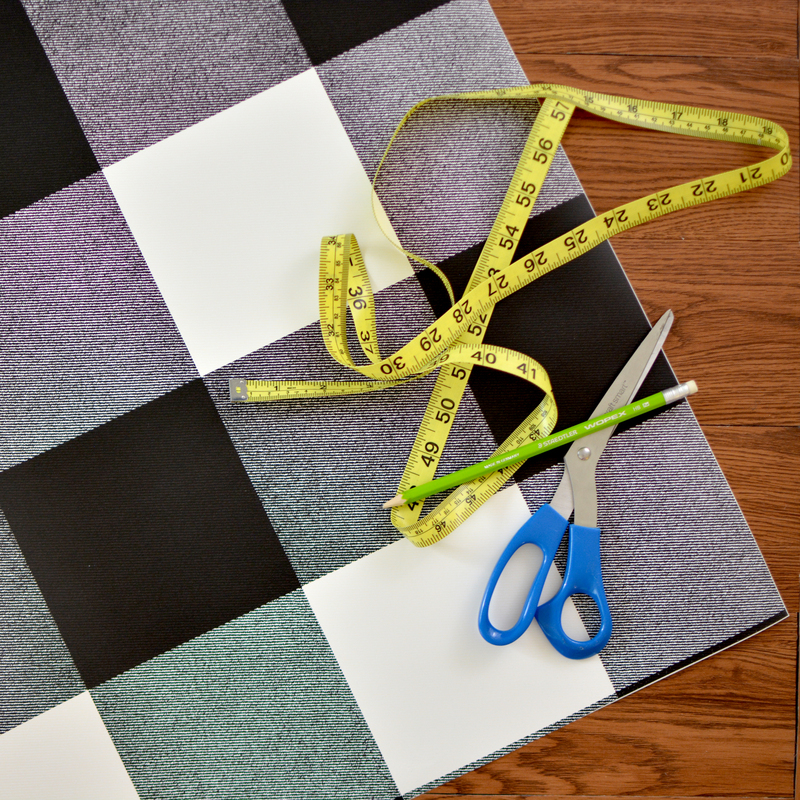 This was the trickiest project to do because I had to cut off another slice and line up the pattern since the sheet was too small for the entire back of the bookshelf – my only tip here is to be as precise as you can with your measurements! 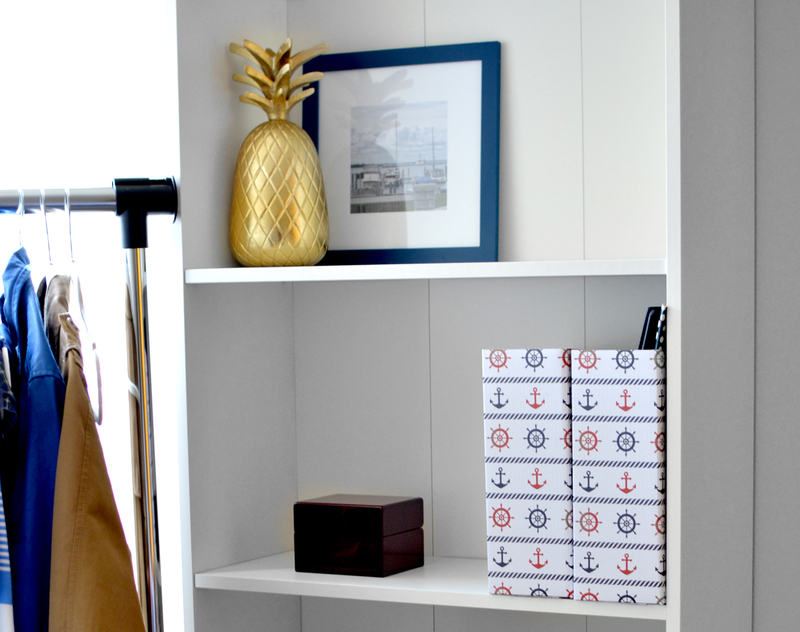 Here I’ve picked out a few more of my favorite and affordable Target finds: the Nate Berkus Ambient Lamp, Pineapple Wood Flushmount Wall Art, Acacia Rectangle Flatware Caddy, White Rope Basket with Fringe. 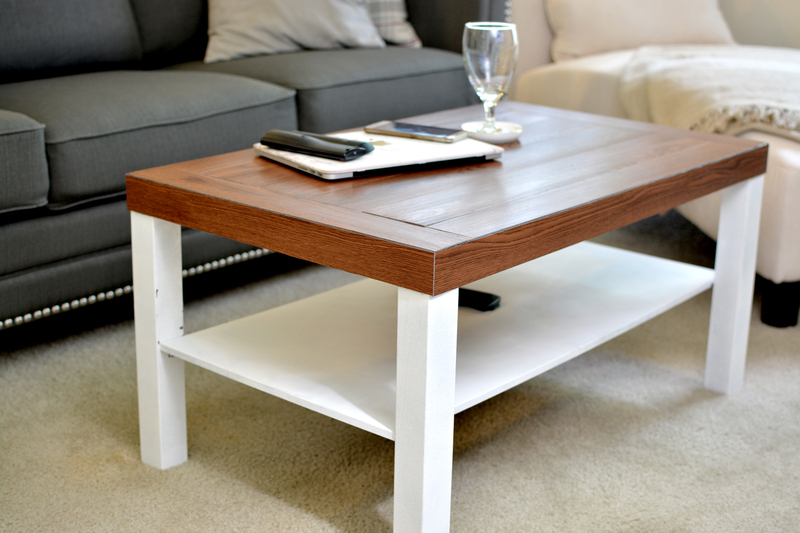 This coffee table is probably my most favorite transformation – and it was so easy! 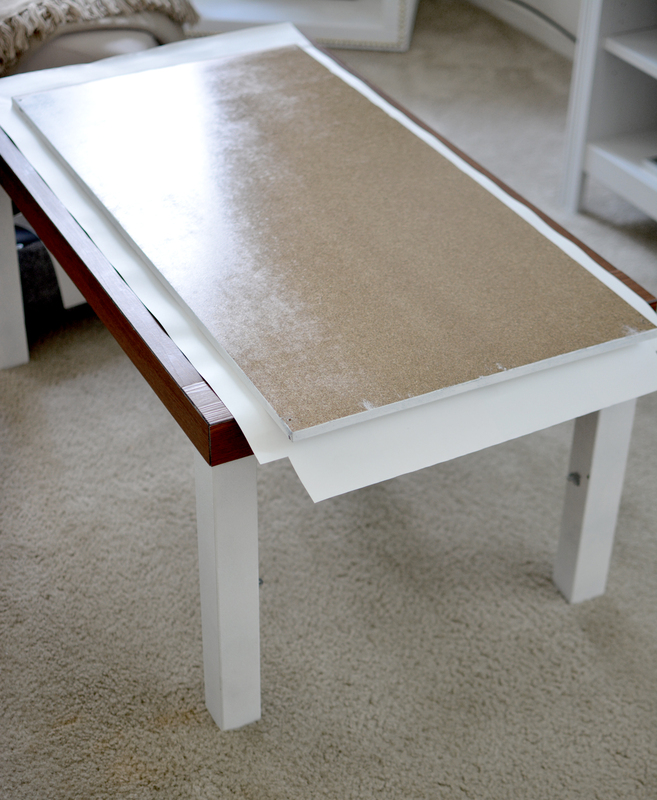 I started by cutting and measuring (a must when you work with removable wallpaper!) and then it was easy to apply this since I was able to take the shelf apart and lay it on top. 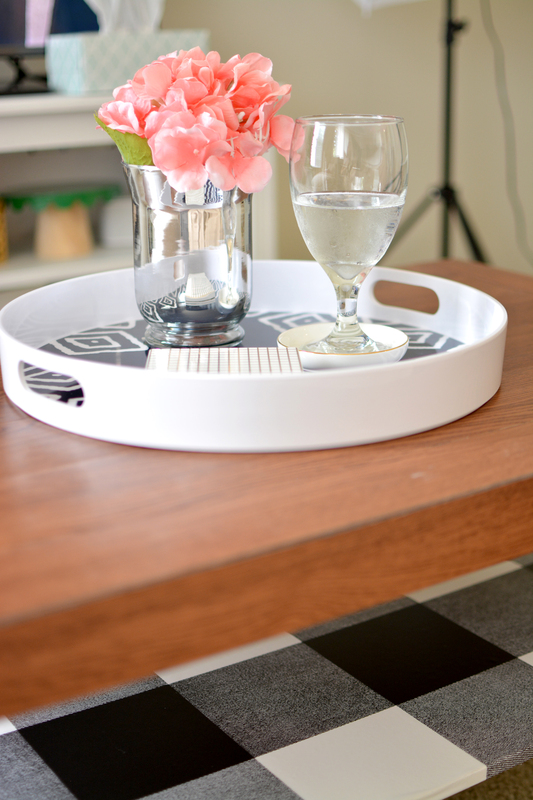 I accessorized my “new” coffee table with this very affordable plastic serving tray in blue from Target. 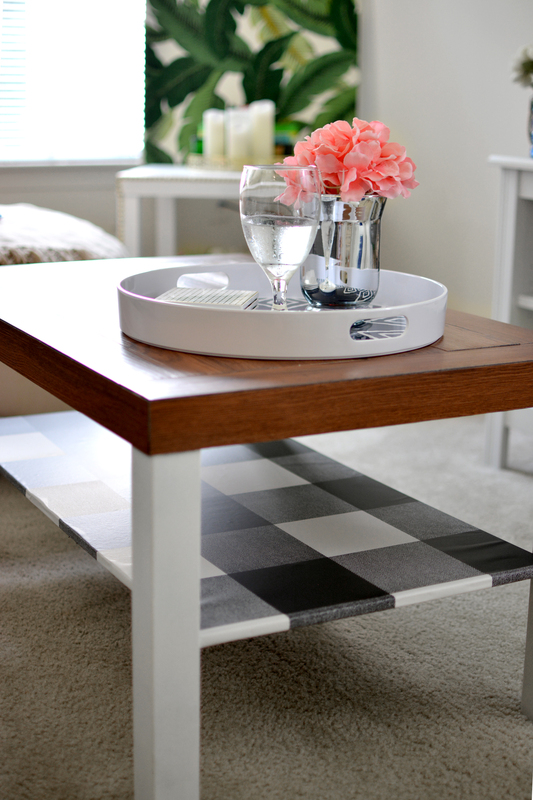 So there’s my secrets to beautiful but removable decor for your dorm room or first apartment! 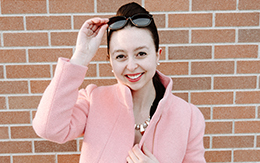 Devine Color has so many shades of paint and patterns of wallpaper in their line that it makes it really easy to find the perfect one to match my style. Don’t forget to look for Devine Color on your next Target trip and stop by Devine Color on Instagram for more project inspiration! Hi! Great project, my mother sent me your article´s link. 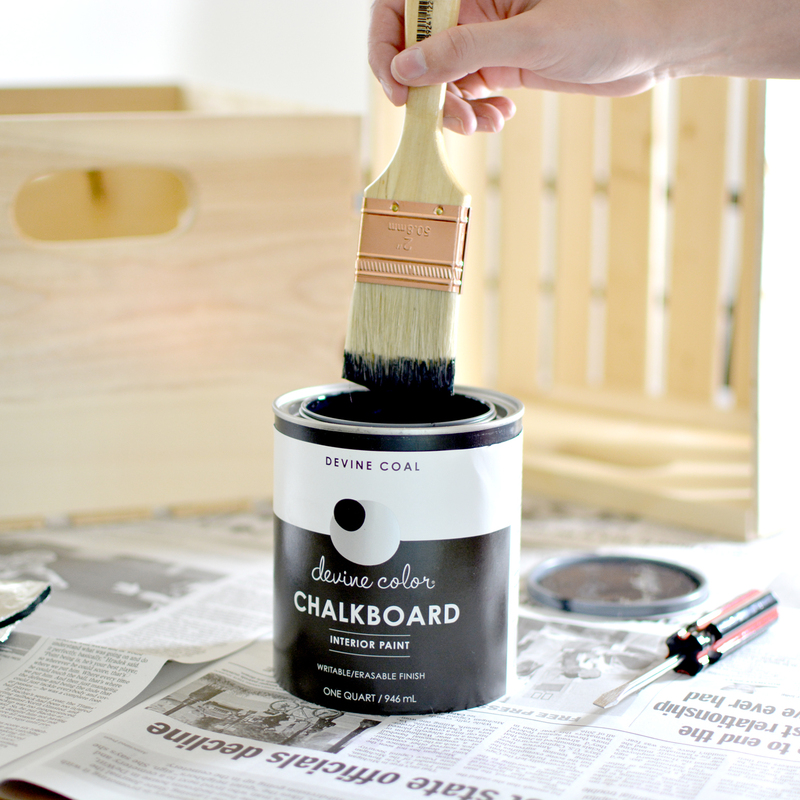 I was wondering if you could tell me if the chalkboard paint takes to long to dry? Thank you.